NOTE: If you encounter a banded bird, please report it to the U.S. Bird Banding Laboratory. Your discovery may lead to our learning something new and important about bird migration, longevity, site fidelity, or general population dynamics. a. These two Pine Siskins, banded a year apart at Hilton Pond Center, were recaptured an hour apart by Dennis Meyer in Duluth MN. b. This was the first Ruby-throated Hummingbird in history to be recaptured and released more than 10 miles from its original banding site. It was retrapped by bander Bob Sargent after a color-marked RTHU was reported to him by an Atlanta-area homeowner. c. This vagrant Rufous Hummingbird was banded late in the fall of 2002 in York SC and recaptured even further north in Ohio almost exactly a year later by Allen Chartier. d. This Ruby-throated Hummingbird from Hilton Pond was found by Lisa Hylton, a non-relative who spells her name differently. It is the only RTHU from the Center that was banded as a southbound migrant and encountered on or near its breeding grounds to the north. e. These two American Goldfinches were recaptured and released by Jim Gruber, a bander at Foreman's Branch Bird Observatory on the eastern shore of Maryland, near Chestertown. 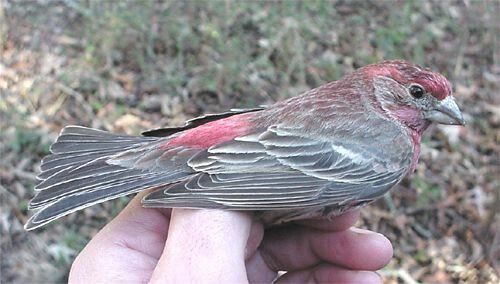 f. This Purple Finch found dead on a Massachusetts highway by Judy Shepard was in its tenth year and only six months shy of the all-time longevity record for Purple Finches.